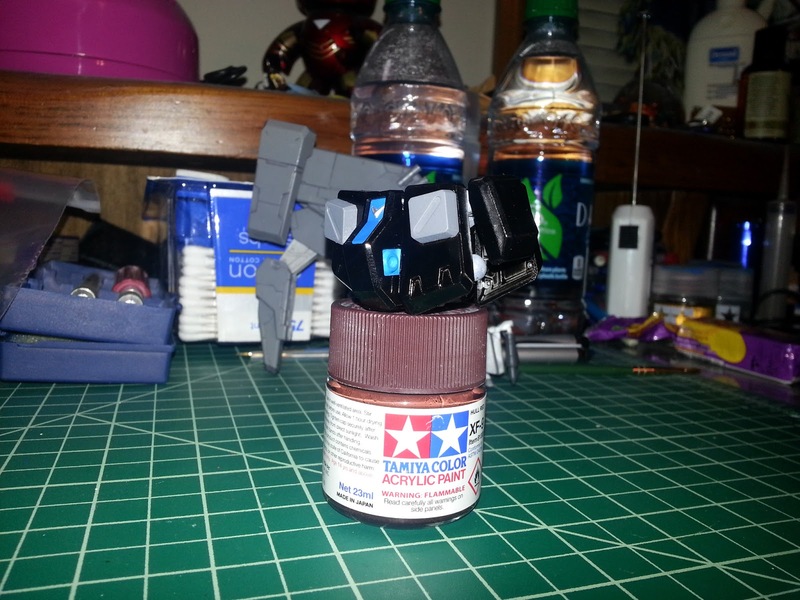 RGM Custom WIP# 2! a small quick build! So this week has been a little crazy with snow and tornadoes and whatnot. Normally the best way to battle power outages and boredom is with some good old fashioned model building. But it's been FREEZING! 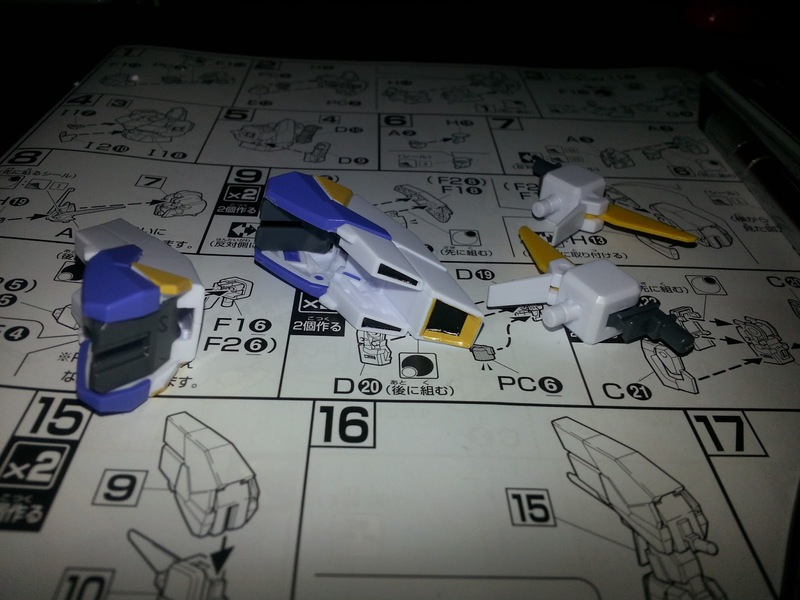 But alas, all has returned to normal (for the most part) and I actually got a little work done on my RGM. 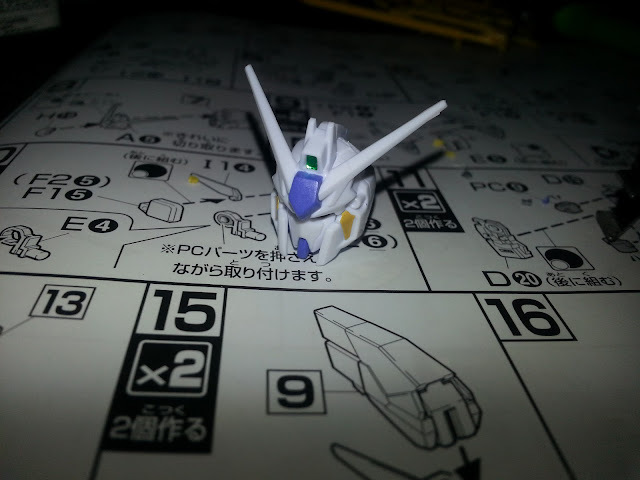 With this WIP, you'll finally be able to see all the colors I'm using in the build. 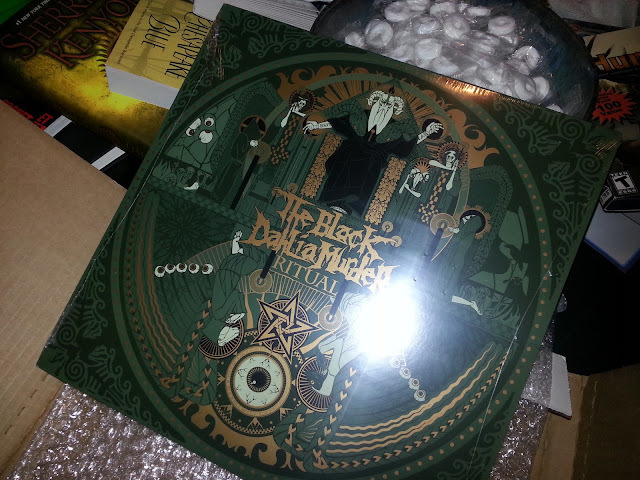 The colors came out a little brighter in the photos, they look just right in person. and there's a few spots in the black I need to touch up ( I guess I overthinned the paint a little) but once that's done I'll hit these pieces with a gloss coat, and move on to the legs! Now that you see where I'm at with my RGM, time to show you the other stuff I've been working on this week. 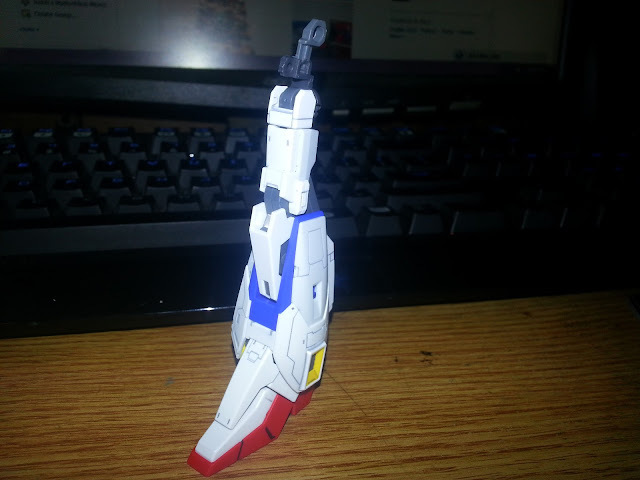 I've got this guy standing and almost complete, I forgot to take a picture. so I guess that'll come next blog. 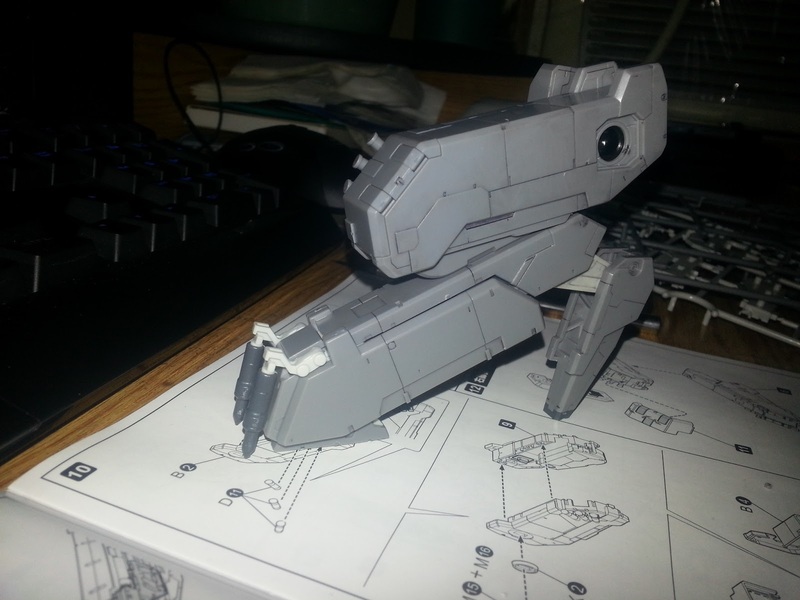 Lastly, I've been working on my metal gear rex the past week or so. but I've decided I want to do a 'lets build' series for my youtube channel. 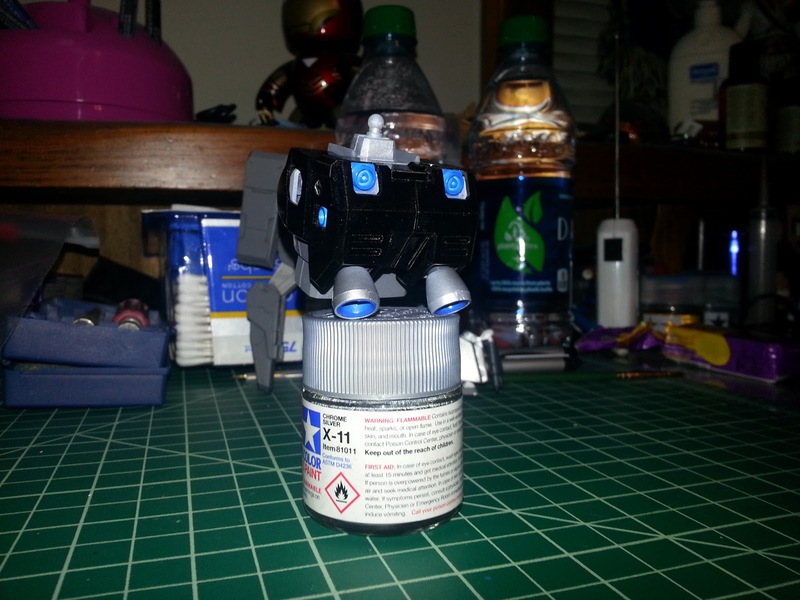 So in preperations for that, I painted up the little liquid figure that's going to be going inside the cockpit on the rex. Once all of the parts have been cut from their runners and separated (I've been procrastinating on this admittedly) I'll begin the series, and you'll all see pictures and more on here. Anyway, that's all I've got for now! So I haven't been in the best of moods lately. So I haven't been too motivated to work, but I'm starting to feel a little better. so regular WIP posts and videos will resume soon. But I didn't want to leave my blog empty for a week. So I thought I'd try something a little different than usual. 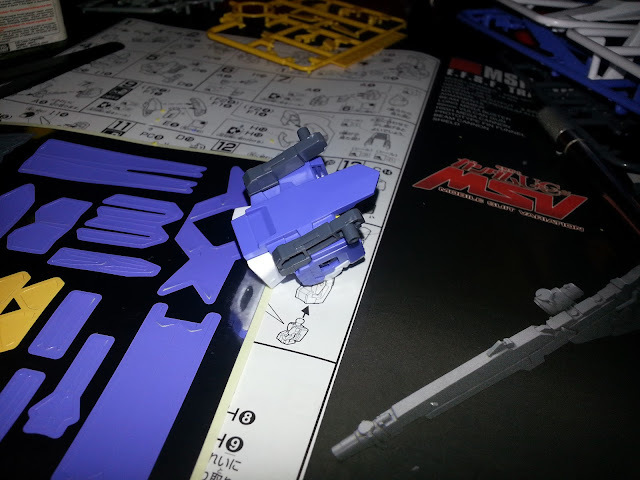 I imagine everyone who builds gunpla, or any sort of model, or heck, if you even just build legos. you usually have some sort of setup or place you do it. your workstation if you will. I wanted to show mine off and show off my 'mobile workstation' because I'm not usually at home when I build gunpla. So lets start things off with my home setup and we'll get into the rest in just a bit. So first off, we've got my desk. If I'm at home, and building. this is where my building takes place. 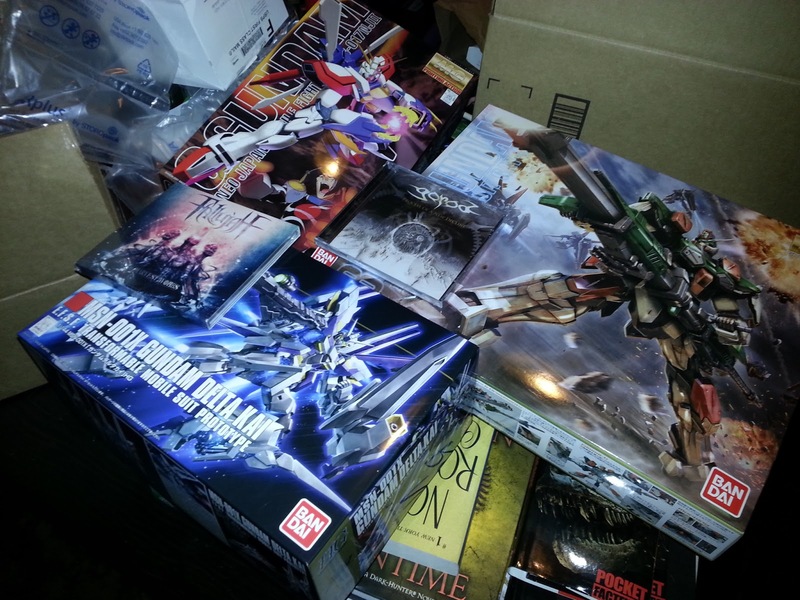 got a nice light overhead, with plenty of gundam markers and other stuff scattered about. it's a bit messy right now. but you get the idea. 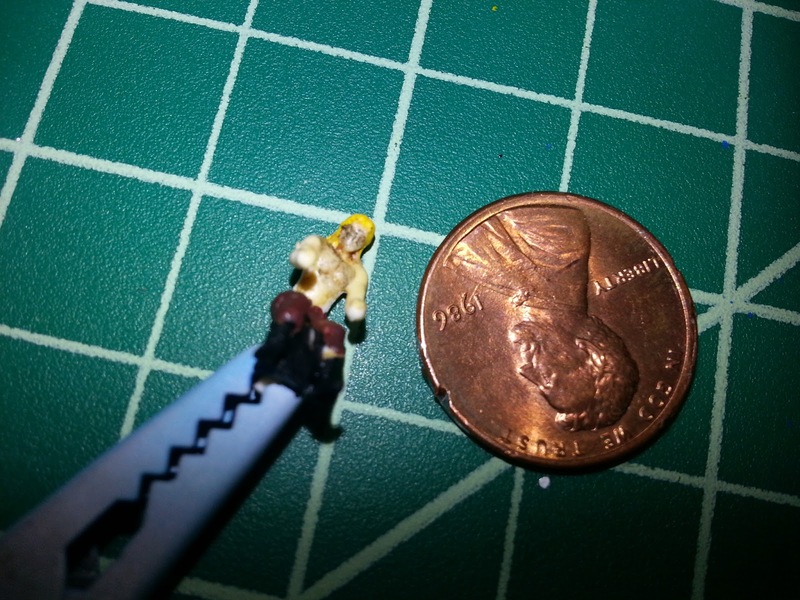 It's got most of what I need for basic construction and even some detailing. another shot of the same desk. still messy. now this is my airbrush paint station. anytime I wanna paint, I peg up pieces and thin down (if it's not already thinned) my paints. and go to town. another thing I love about my battlestation is that both of my setups are pretty close to the TV. so I can pop in a movie and enjoy. although sometimes that can lead to distraction. WHICH IS BAD. Now that you've seen my home setup. I'm not typically home when I'm working on gunpla. Since I work nights, and don't have internet at home I usually hang out at my moms house on my days off, so lots of my actual building gets done there. So instead of carrying handfuls of materials with me wherever i go, I've set up what I call my Mobile Workstation. Here it is. in all of it's glory (and mess) this box has most of the materials I need to do a straight build of any kit I'm working on. Pictured here are my gundam realtouch markers, which i use mostly for panel lining, and my gundam paint markers (which i hardly ever use at all), Scissors for cutting bags, or cutting out dry transfers and water slides, some crappy synthetic brushes; which I don't use very often. but I figure it's better to have than to want... just in case i ever need them. 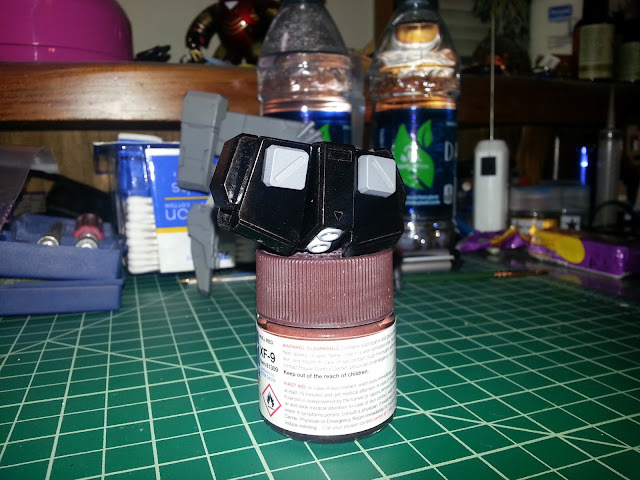 Some tamiya masking tape, I don't suppose this really needs to be here because this'll likely only be used in painting. but I keep it in here just in case. Sandwich bags! if you're painting or just seperating pieces. or you stop mid build. these are indispensable. A tripod for my camera, that's self explanatory. a screwdriver, also self explanatory. My video camera, also not sure why this is in here, but it is. never know when i want to videotape something. Tape, for dry transfers mostly. thinner and brush cleaner, for detail painting. 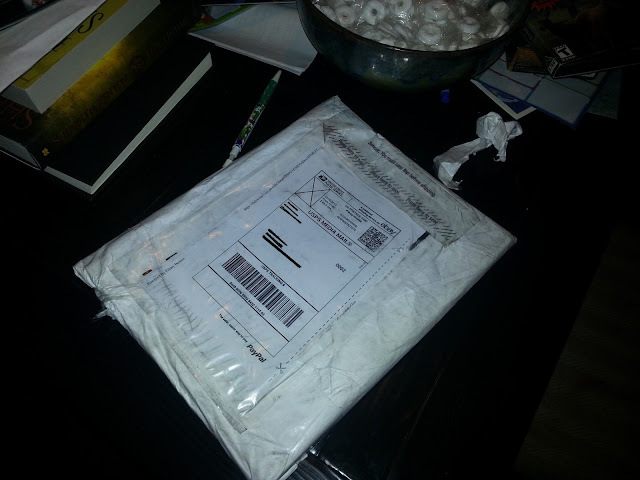 and finally my tamiya weathering master kits. and in the little red box pictured above are my testors paints, my mr hobby cement, some paint holding stuff, a mini cutting mat, some sandpaper, hobby cutters, tweezers, x-acto knives, pin vice, panel scriber, and a handful of other things. nothing too fancy. 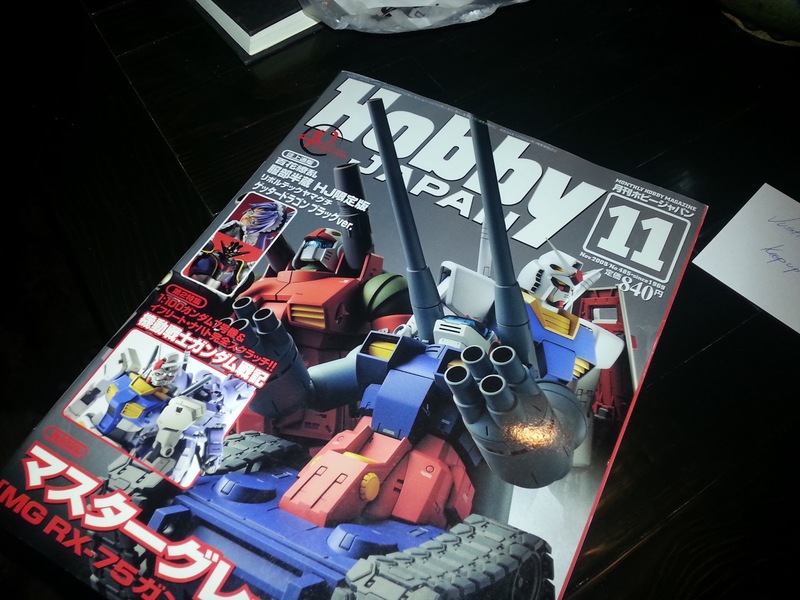 and when it's all packed up you can sit a model kit right on top and it doesnt' slip and slide around too much. this got out of order, so here's another shot of everything sitting out. 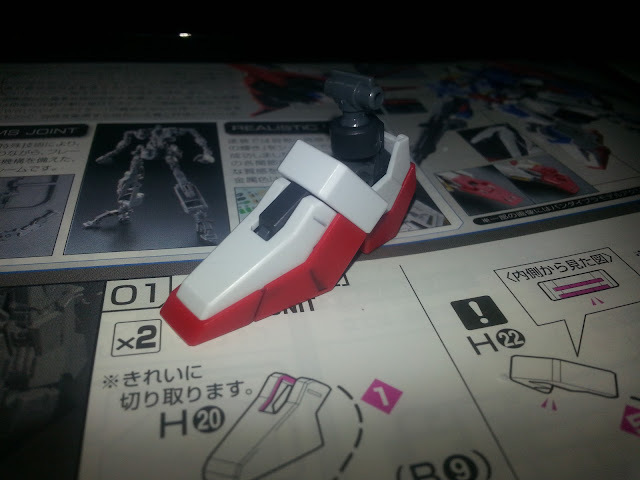 you can even pop little SD kits, or HG's in there nicely. 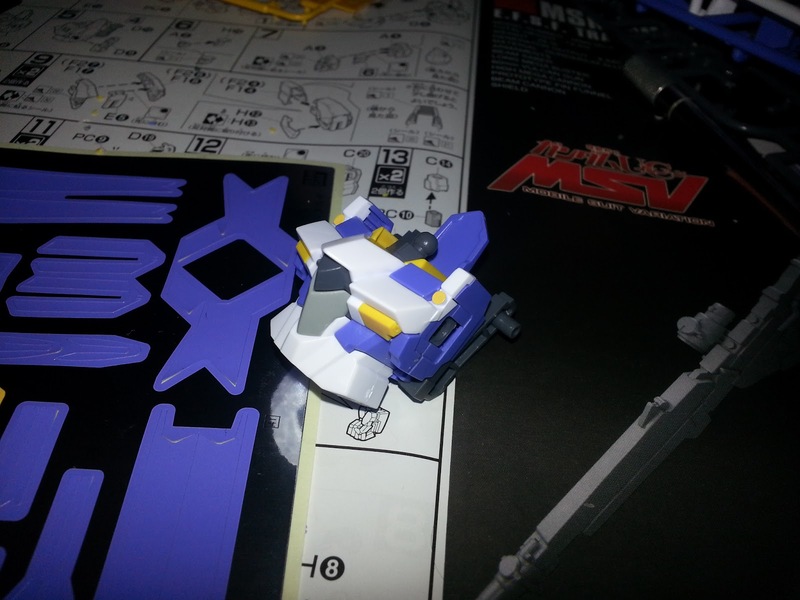 and even your standard sized MG kits fit pretty well, so no worries about carrying too much stuff. 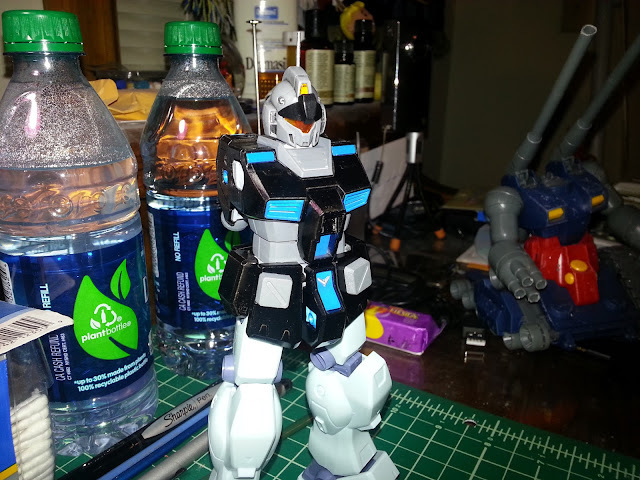 and a few shots of the GM Custom from what I HAVE done to it. 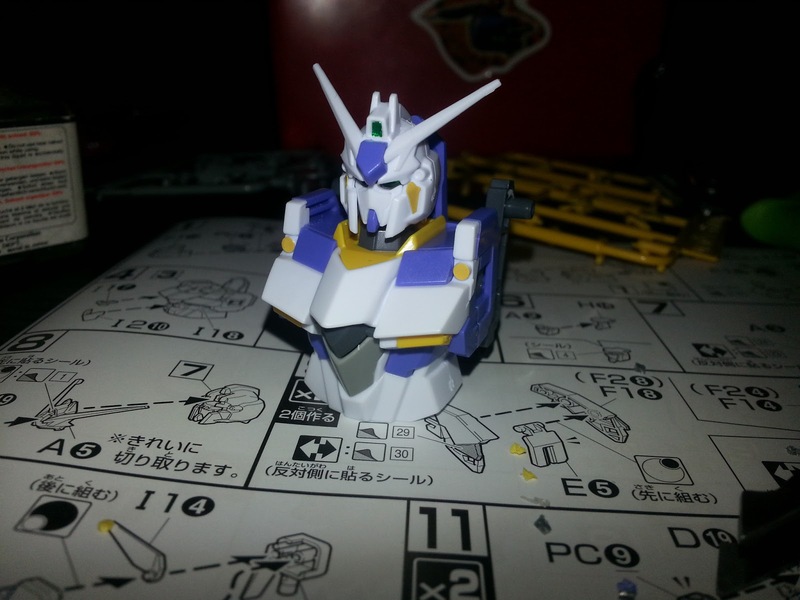 First up, the head has been painted. and so far i'm completely happy with what i've done. have some touching up to do because when re-assembling I chipped the paint on the back. 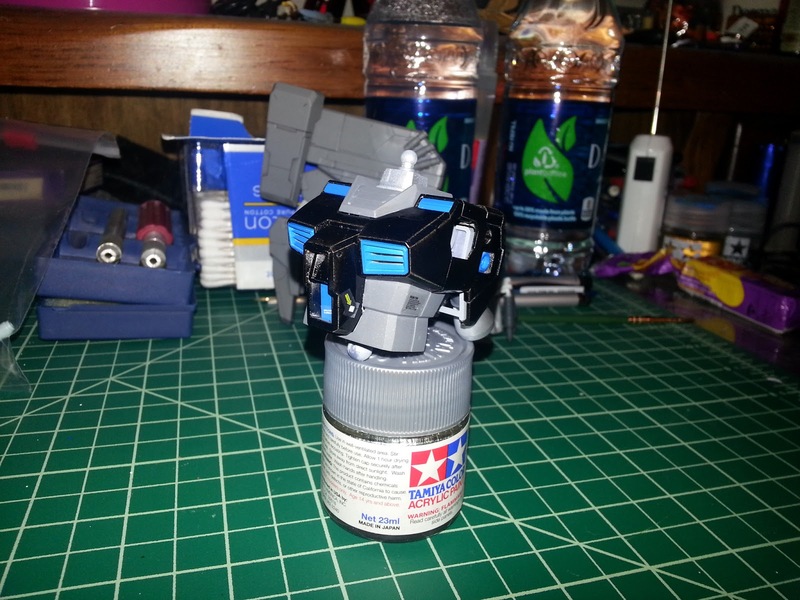 the grey/black combo works well on the GM i think. and the orange visor looks really slick. a back shot. you can see the chipped paint from where i was putting the antenna on. gonna touch that up, as well as adding another layer of orange to the back camera. another shot. you can see the painted vulcan a little better from this angle. and one last shot. so that's all i've got this time. thanks for checking my stuff out. got some big plans coming up soon I think. hopefully you guys keep following me to see what I've got in store. another thing. sorry about the bad punctuation and stuff. it's freezing and i'm just trying to knock this post out before i get hypothermia. I guess even though I technically showed part of this off last week, it was only the head. so this week will be MOSTLY dedicated to the GM Custom. Starting things off simple with a build. May do a quick video review of it afterward, with a quick photo shoot as well I think. then it's dis-assembly time. I'll be removing a few seams on some of the armor parts, and some of the internal frame bits prior to painting. my color scheme will be entirely custom. 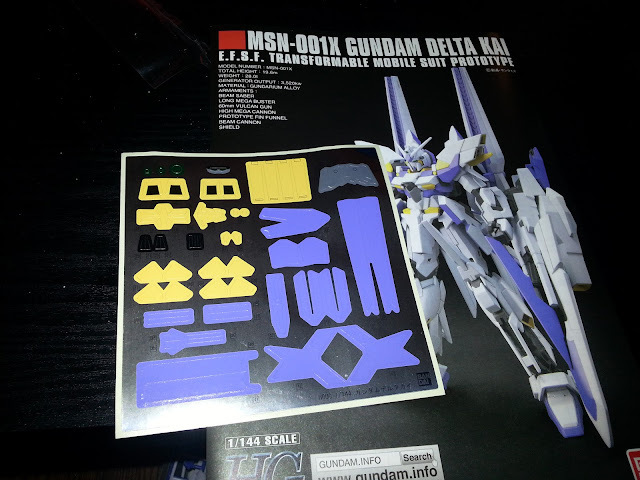 (although I'm not 100% how I'm going to be tackling this yet; as it is my first custom) This post isn't going to be super content heavy, although I'm hoping I can complete the build of this tonight before I head home. So that will be a goal, and perhaps I'll be able to do another small blog post with a Youtube video tomorrow. We'll see. anyway, on to some content. 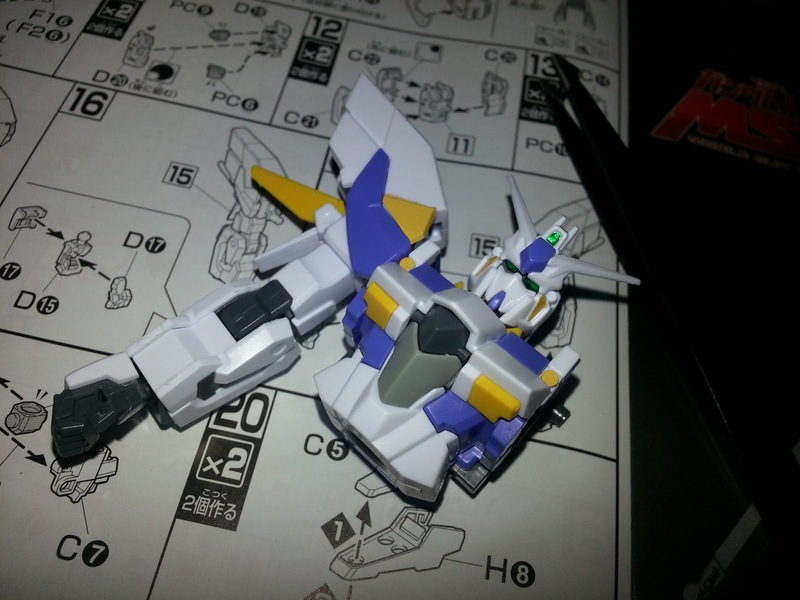 Right arm completed, aftermarket hand in place! Tonight's setup was slightly different than usual. 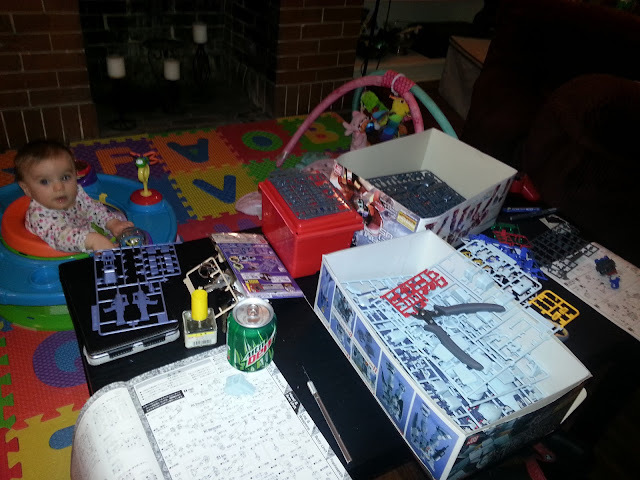 I got my best friend Aaron motivated to start his MG Titus (hopefully I'll get some documentation of that here soon) Gunpla building and TV accompanied by my favorite child thing. and this is where I'm sitting now. I skipped construction of the other arm so I had something to stick the first arm too. So far the build is pretty straight forward, although the old style instructions leave a lot to be desired in the ways of clarity. But a nicely engineered kit so far! Anywho, I also recieved a few packages in the mail! only one thing directly gunpla related. So I'll talk about that first. Then some other stuff.. I guess early last week, I messaged Dan about some stuff, and he mentioned he was going to be messaging me, he had something lying around that he was going to send to me! So we exchanged information, and I recieved it this morning and was beyond pleased with what he had sent me! 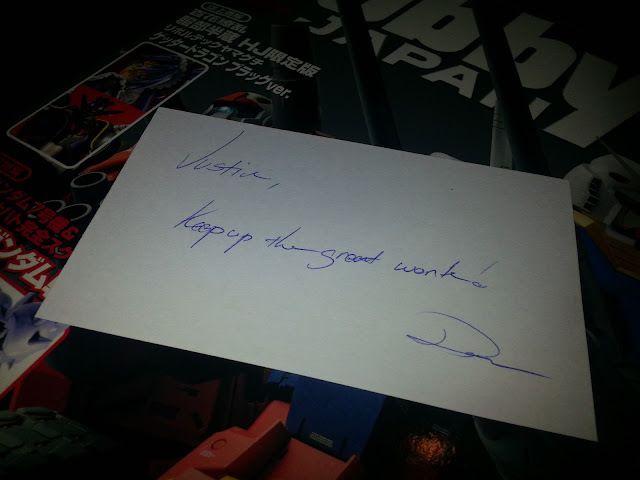 a little note from dan! 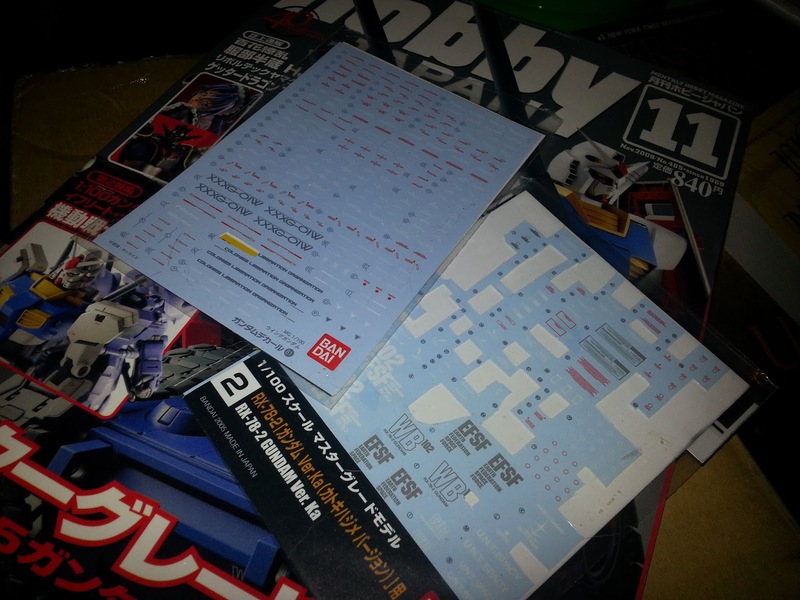 and a complete set of water slides for the wing gundam! 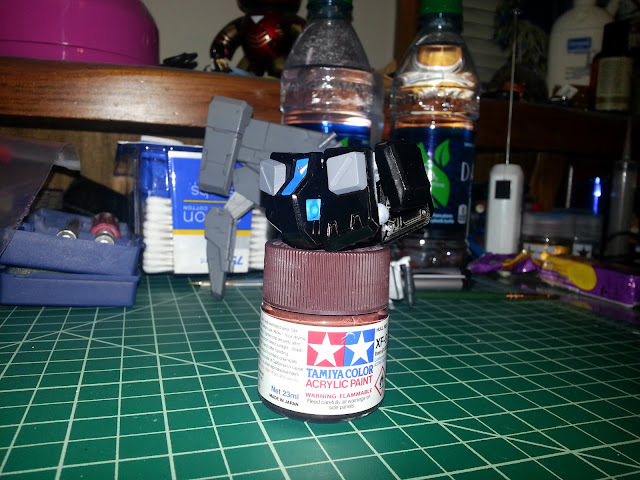 and some leftovers for the rx-78-2, which I will be sure to incorporate into my MG build for the OYW ver. plenty of warning labels left over and a few EFSF markings. 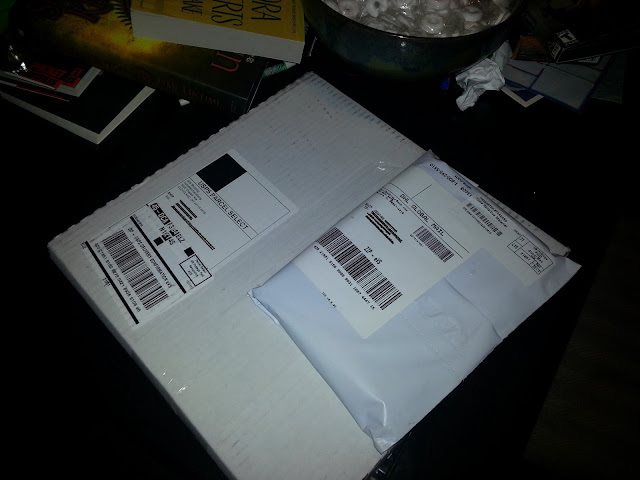 a little something from my pen pal, and a little something I bought myself! :D my pen pal got me God Hand on the ps2, which I got rid of for some reason or another back when I was younger. but once again we have been reunited! Thank you Teal!! 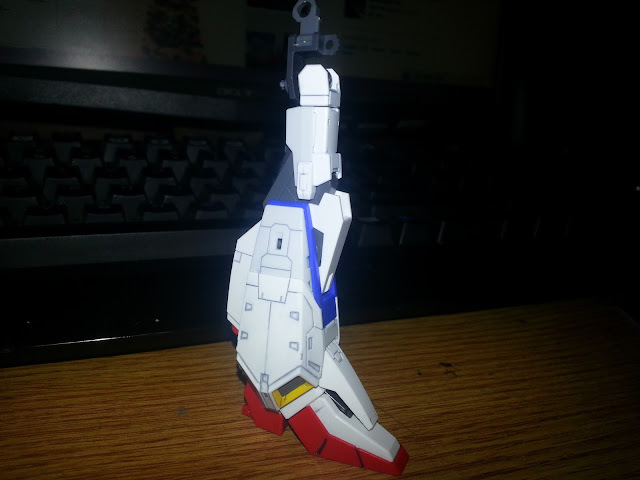 Anyway, That's it for the post, gonna try to wrap this RGM up, and Hopefully finish it up tonight. at the very least, I've still got tomorrow off. so I'll see you guys next time! First post of 2013! (well, the content is 2013) some new stuff, and some old stuff! Well, I'm considering this my first post of 2013, because the last post was supposed to go up a few days before, but with my accident and all that, it obviously didn't happen. Anyway, on to some developments. I need to learn to format this blog better, I guess that includes making jumps, as well as using tags and getting everything more organized. I'm not sure which of these will be implimented when, but I plan on doing it all ASAP. Tags will begin immediately. not that my blog has a ton of posts right now anyway, so it's relatively easy to find most of my content with little to no trouble. But who's to say that won't become more complicated in the future. I think as far as actual maintenance is concerned, that's that. now this is where I'm going to express my sadness and I guess disappointment for this kit. The legs were awesome, a really strong and fun build. lots of neat little moving parts.. but as you can see in some of the earlier images. The tops of the legs aren't pegs or ball joints, they're on that flat little piece, and most of the other joints are held on in similar manners. 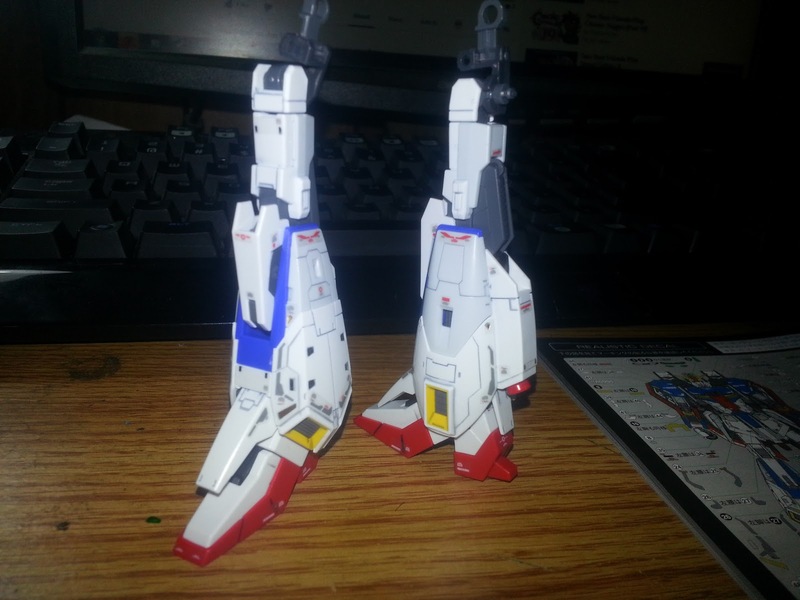 well, as i was putting decals on the back of the kit, i noticed one of the plates on the back wasn't sitting just right, and took it off to fix it, in the process of doing that, the part that held the torso to the hips came disassembled. so i fixed what i was trying to fix, and went to reassemble. and that's when disaster struck. i got a bit of resistance, and suddenly a snap. 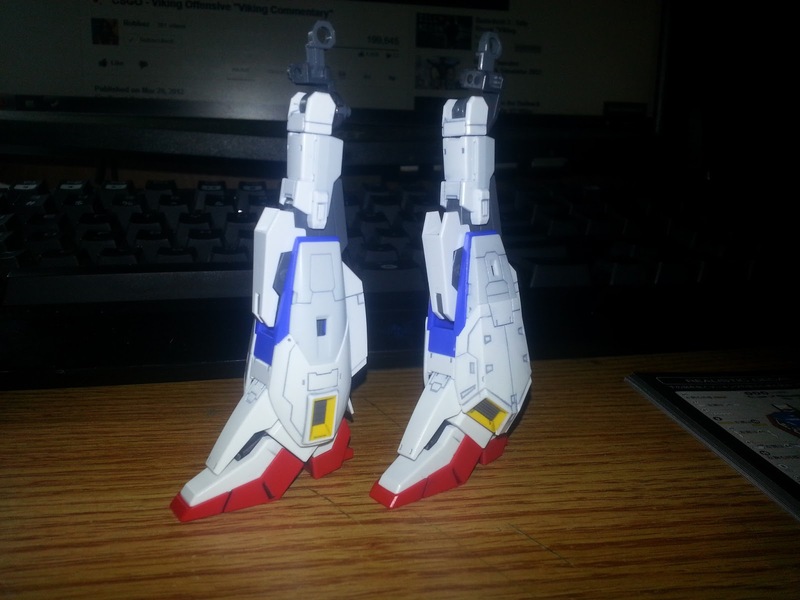 the whole 'spine' of the kit snaps in half, and now i'm sitting with two halves of a zeta.. in my frustration i drop the kit on my desk and take a deep breath trying to figure out what happened, and how i can fix it. but I think the only way is an extreme amount of patience with glue, or to just order the two pieces that snapped in half, and I really don't want to wait or spend any money on replacements. so here's the current state of where things are. I've decided to scrap the project. I don't have any interest in completing it. I bought the kit on a whim, and rather than trashing the kit. I'm going to send it to a friend, and I'm sure he'll give it a good home. I just want to put a word of warning out there to anyone considering buying this kit. 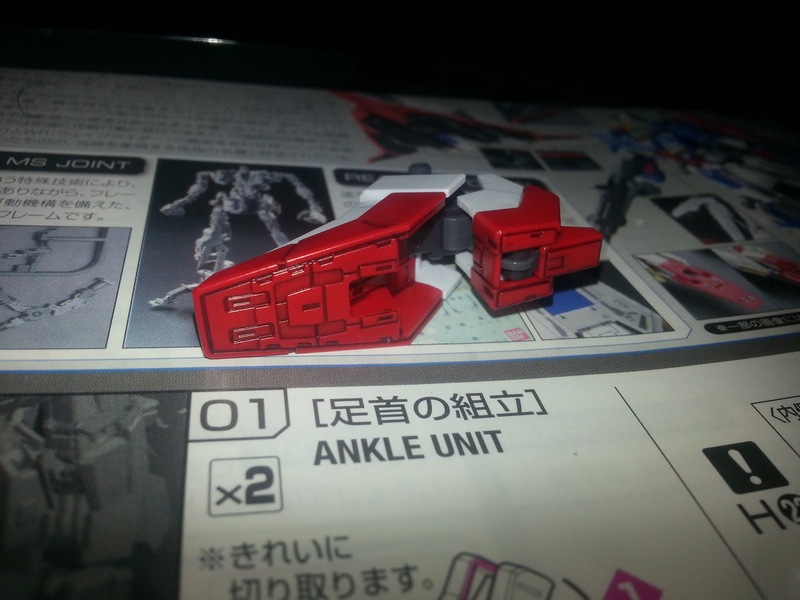 It looks like a great kit once it's done, but you have to be extremely careful when building it, because things like this can happen. 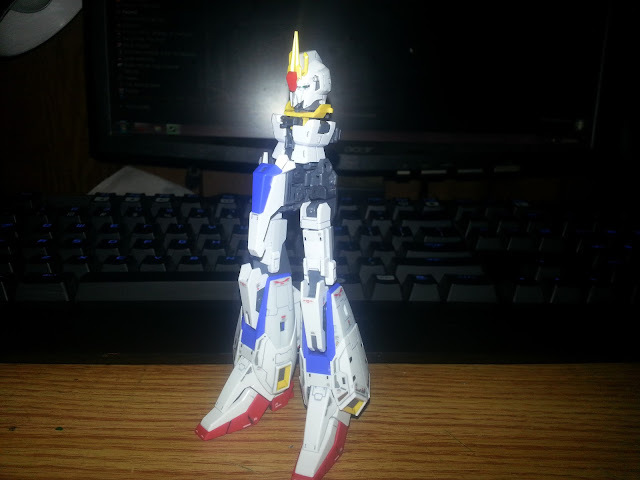 but I blame bandai mostly on putting more focus on a no-swap transformation instead of worrying about having a stable kit that is a solid build. that's not me saying this kit is bad. this is just the impression it left on me. My new current project, despite all of my setbacks lately is going to be my gift from the gunpla gift exchange. (THANK YOU AGAIN CHERRYCAT!) gonna be test-fitting the whole kit, looking for what needs to be modded and changed up, and airbrushing. I'm most excited to test out my new alclad II metallics on this bad boy for the frame. I'm going to do be doing the armor in a custom color as well, so stay tuned for that. not the heftiest of kits. 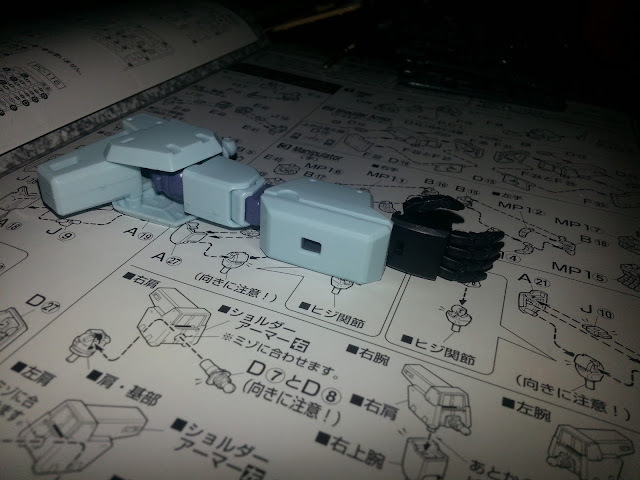 but that's because there's no inner frame for the arms, and I'm sure other liberties were taken. 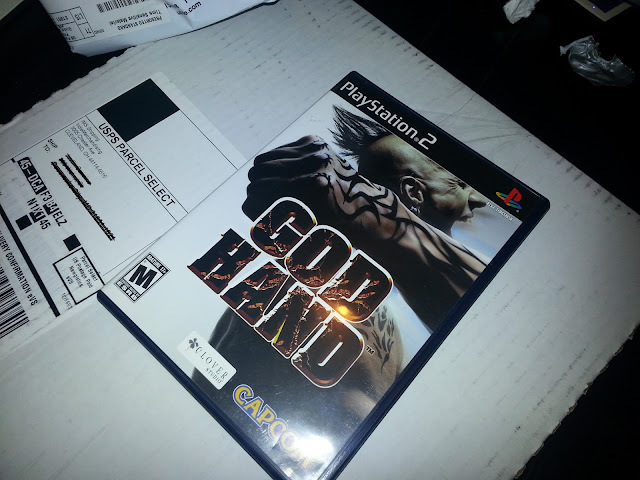 either way, I'm very excited to start throwing down on this. 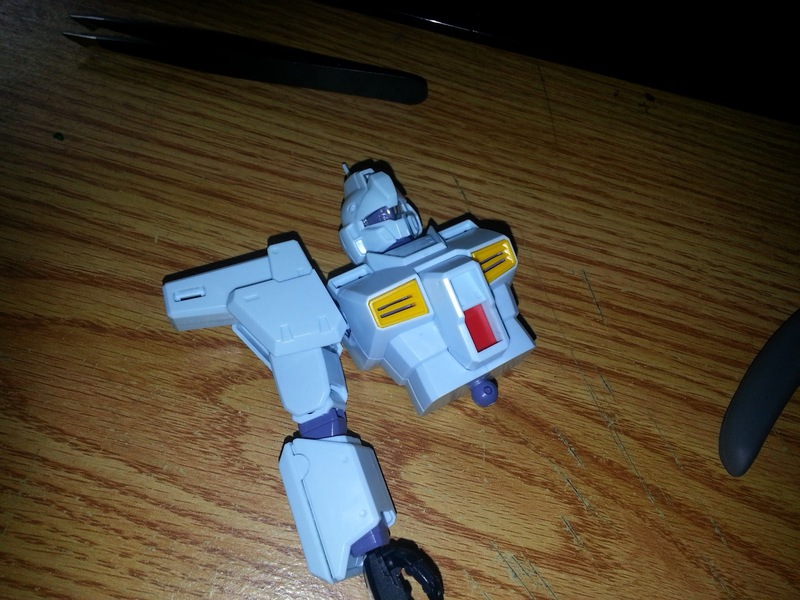 I've got tonight off, so I'm gonna try to finish the torso and arms at least. we'll see what my time allows. after i unboxed and photographed everything, I laid out the parts for the head and snapped that all together! and that's all I've got for this blog post! Sorry about my projects jumping around so much. I'm going to sit down and try to focus on one kit at a time for a while, until i can get into a comfortable work routine. i'll see you guys next time! enjoy!